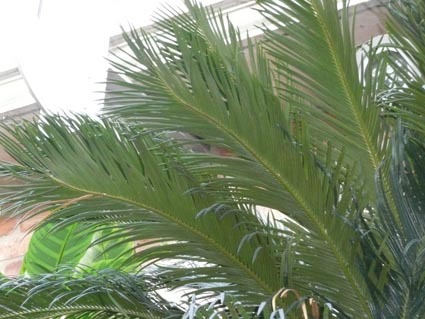 This is one of a series of short articles about cycads in the Belfast Botanic Gardens, compiled by members of the Friends Group. 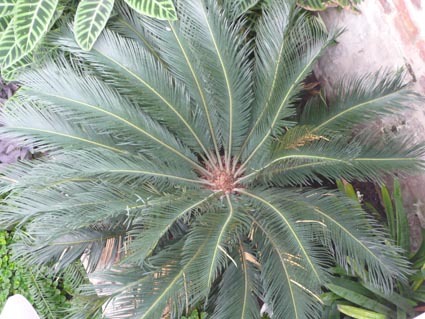 There 116 species of the genus Cycas. 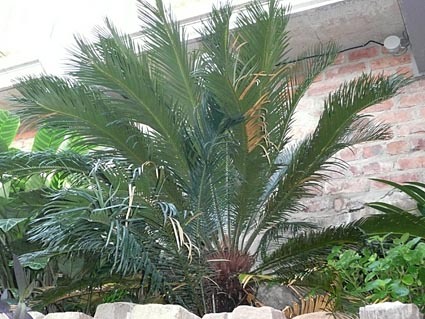 Cycas revoluta is probably the best known of all cycads. Almost all botanic gardens have one and it may be found in domestic gardens in milder temperate regions. Although it is hardy to -10degC, at this temperature it will lose all its leaves and behave as a deciduous plant. The plant, its seeds and pith are poisonous, but in spite of this, sago an edible starch is made from the pith of the plant - repeated washing removes the toxins. The plant is extremely poisonous to animals; the cycasin toxin can cause permanent internal damage and it is also carcinogenic. As with all cycads Cycas revoluta is dioecious - having male and female cones on separate plants. The species name revoluta refers to the twisted leaves.